For the Young Beginner. Faber Piano Adventures. 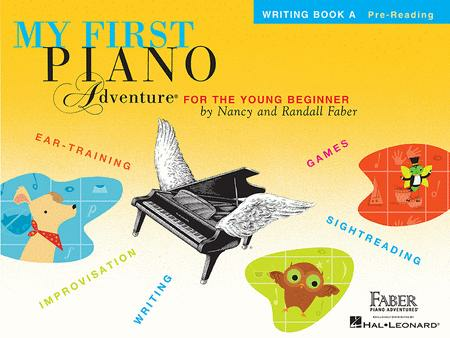 Written for ages 5 and 6, My First Piano Adventure captures the child's playful spirit. Fun-filled songs, rhythm games and technique activities develop beginning keyboard skills. Instructional and Method. Instructional book (softcover). With accompaniment CD. 64 pages. Faber Piano Adventures #FF1620. Published by Faber Piano Adventures (HL.420260). I have used it with early age beginners, and find that pages that have less interesting work still have something to expand on. Students and parents respond to it well. Liked it very much except some of the pages were too much paper and not enough interesting stuff. Excellent. Waited a long time for this kind of material. I use it with all beginners, no matter what age. This is a great book for young beginners. It's clever and fun and the kids love it.